The ongoing shortage of parish priests within the Catholic Church is the lasting legacy of the post-conciliar generation. Repeatedly in recent weeks I have been reminded of this current crisis. The ongoing lack of priests is nothing less than an attack against the sacraments. Let’s start with the Holy Mass. Bottom line, fewer priests means fewer Masses offered, which literally means a world with less grace. Masses offered for the departed, masses offered for the living, masses offered for our private intentions, all significantly reduced because of the shortage. This doesn’t even take into account the daily, often private, masses offered by priests. Confession has also been severely impacted by the current level of diocesan priests. Anyone, ANYONE, who has been unable to have their confession heard because their parish priest ran out of time understands this. Anyone who has remained in a state of mortal sin for far too long simply because they were not able to make the one hour a week offered for confession at their parish (or neighboring parishes) understands this. Any priest who has ever had to turn penitents away because they had to prepare for Mass knows this to be true. Those departing this life are not exempt from this crisis either. Families who have had to wait hours for a priest to arrive to annoint their loved one know it. With only one or two priests assigned at many parishes, some families with dying loved ones have to wait for daily masses to conclude before their priest can arrive to administer Last Rites. Make no mistake about it: the current shortage of priests is a supernatural attack by the Evil One against the sacraments, against our availability to grace. 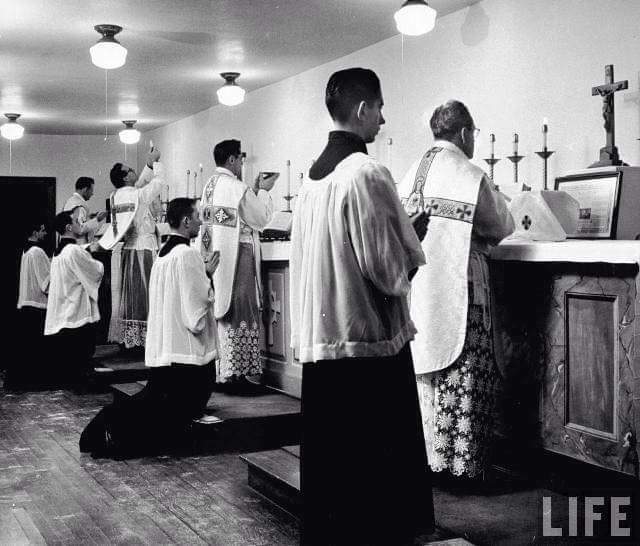 We need look no further than the prior generation, those boomers who preferred cafeteria Catholicism to timeless truths, for our current shortage of priests. Woe to you Catholic couples who contracepted away the future, depriving today’s generation the men who might have discerned a calling to the priesthood. Woe to you priests of the 1970’s and 1980’s who used the confessional to tell husbands and wives to “search their conscience” when it came to mortal sin, taking it upon yourselves to contradict the Church’s immemorial teaching on contraception. Woe to you clergy who aggressively laicized the liturgy and feminized the sanctuary, turning the Holy Mass into the profane playground of little children and old women, instead of the Sacred realm where fathers and mothers introduced their children to the eternal. Woe to you rectors and diocesan bishops who pushed heterodoxy and homosexuality at seminaries, saying goodbye to the good men who had indeed discerned a calling. Your fruit has been priestless parishes and multi-million dollar settlements. Today’s Catholics will continue to pay the price for past infidelities committed against Our Lord’s bride, the Church. We will either grow in holiness, or descend into sin, depending upon how we react to this shortage of priests; this attack against the sacraments. Every marriage today that stays open to life, heroically challenging a culture which celebrates contraception, sterilization, and abortion, grows in holiness. Every Catholic family that fills an entire pew at Church because of the abundance of God’s blessings is an invitation to hope. Every Catholic priest who gives his all, every hour of every day, to dispense God’s grace through the sacraments is bringing healing to the Church and the world. Hours in the confessional and sacred liturgies that attract men and help them to discern make a difference. Holy priests courageously struggling to live their vocations are an invitation to hope. It took a full generation and then some to decimate religious orders, seminaries and the priesthood. We have seen the trend reversing, slowly, in recent years. We have the reemergence of tradition and orthodoxy making a difference (there is a reason why the Diocese of Lincoln has been a leader in vocations for twenty plus years). Pray that this generation accepts the role given to us by divine Providence. May we leave for the next generation a Church with more priests, greater availability to the Sacraments, bursting at the seams with grace. For, as St. Paul instructs, “Where sin increased, grace abounded all the more.” (Rom 5:20). Posted on April 3, 2016, in holiness, life, liturgy and tagged church crisis, priest crisis, priest shortage, sacraments, vocations trend. Bookmark the permalink. 7 Comments. I call it “Planned Fatherhood”! yea, i agree it’s an attack on the sacrament and yet catholic families seems not to sence the obvious by keeping their children away from the vocation of priesthood. I trust in Jesus’ word that the kingdom of hell will never prevail against his church. God save us. Nah, unnecessary. We just need more dioceses following the example of such perennial vocations leaders like Lincoln, Nebraska: altar boys, male lectors, no permanent diaconate, acolytes, Catholic high schools staffed by orthodox religious sisters. This solution works for traditional dioceses and traditional orders. The western church has a tradition of nearly a millennium of the celibate priesthood. We need to seriously consider the purpose behind this practice. Very good idea. Not only that… why not examine married priests like our Orthodox brethren do, or even like some the other Rites in the Catholic Church allow. The celibacy of our priests and bishops was a great idea in response to Church’s issues in the past… Perhaps, looking at the time we live in, its time to ordain married men in our Roman Rite. I love the picture posted at the top of this blog (sarcasm). Is the real agenda of this post to go back to ‘mass factories’ that really had very little relationship to the Church community that it was related to? A few years ago, on Holy Thursday, during the traditional prayers, there was a petition for more vocations for priests. At that time at my very post VCII church, there were 10 ordained and married deacons, all trained, all able to preach, and all quite competent to step up to the priesthood up on the altar. It became amply clear to me at that point that there is not a priest shortage, but a problem of the Church and Hierarchy’s own creation. The answer to the prayer was standing right there on the altar, save the obstancy and pride of the powers that be causing them to blindly follow a tradition that was set up set simply to protect the power of the Church, consolidate it in an army controlled by Rome, and ensure that the Church and its wealthy lands and estates continued to be passed on to the Church and not the sons of the priests. Not a very noble beginning for the practice of an unmarried clergy in my opinion. It sounds like that vocation pumping machine in Lincoln really has it in for everything that brought women into a fuller role in the Church. And the laity as well if they have no permanent deaconate. I just did a bit of research about the diocese and about the former bishops. Perhaps some love them, but they look like stumbling blocks to me. Very happy to live very far away from men that. Brian Williams writes, “We have seen the trend reversing, slowly, in recent years.” Yes, but Bergoglio seems to be doing all he can to stop the trend from reversing. Of course he talks about a “crisis in vocations,” but then he destroys flourishing groups like the Franciscan Friars of the Immaculate because of their “rigid” attitude toward the liturgy, i.e., because of their love for the Traditional Latin Mass.